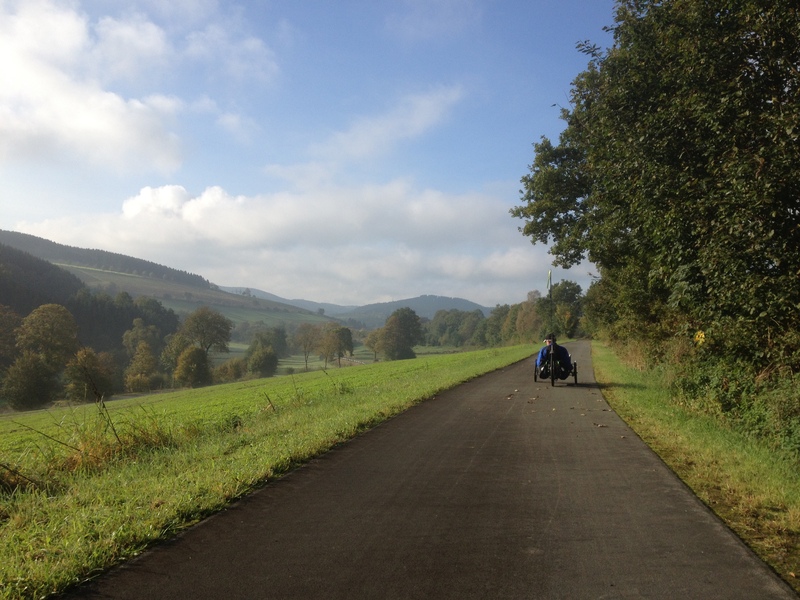 A month ago I cycled the Vennbahnradweg from Aachen towards Luxembourg with Klaus, fellow recumbent triking chum here in Germany. 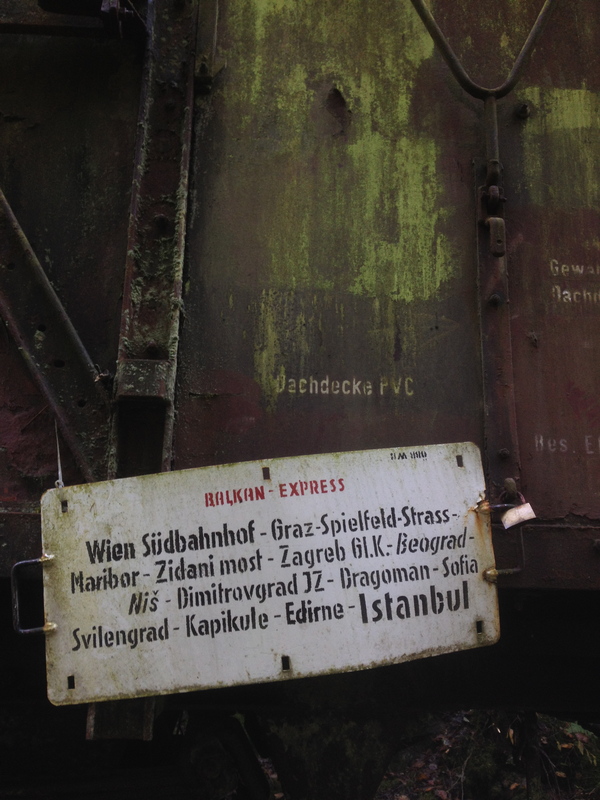 We enjoyed our 162.5km on a disused railway line so much that Klaus did some more investigating as to other suitable Bahnradwege near here that we could try. And he discovered the Sauerlandradring. 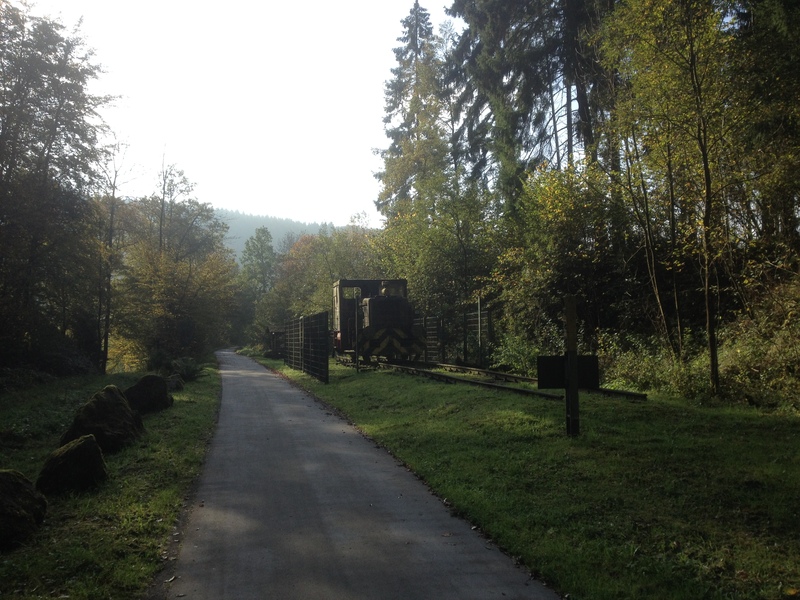 This is an 85km route which consists of some Bahnradwege (former railway tracks converted to cycle paths) as well as some linking routes. 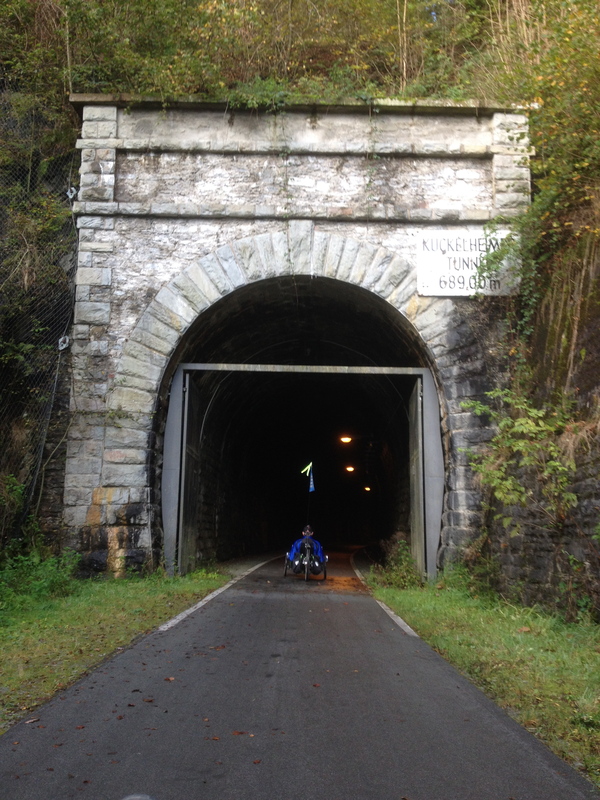 He knew of some recumbent trike riders who had cycled this a while ago and said it was good, so we decided to give it a go and picked a weekend mid-October, hoping the weather would be good. We would need to borrow my landlord’s VW Bus again (to fit both trikes in) and it was available on Sunday 12 October so the date was fixed. or also adding the Nordschleife section (another 45km) which takes the route up to the River Ruhr. There was a note on the website for the Nordschleife that part of it was closed so we would have to cycle the same route up to Meschede (on the Ruhr) and back (it’s normally another circular route). I haven’t actually visited the Ruhr so fancied the extra section but we weren’t sure, this late in the year, whether that would be too much (it might be dark by the time we finished). So we gave ourselves the option by starting the ride from Eslohe (where the Nordschleife section heads off) so we would know, when we got back towards our starting point, whether we would feel like another 45km of cycling. The official route starts in Finnentrop. We would also ride it anti-clockwise rather than clockwise (the normal direction). 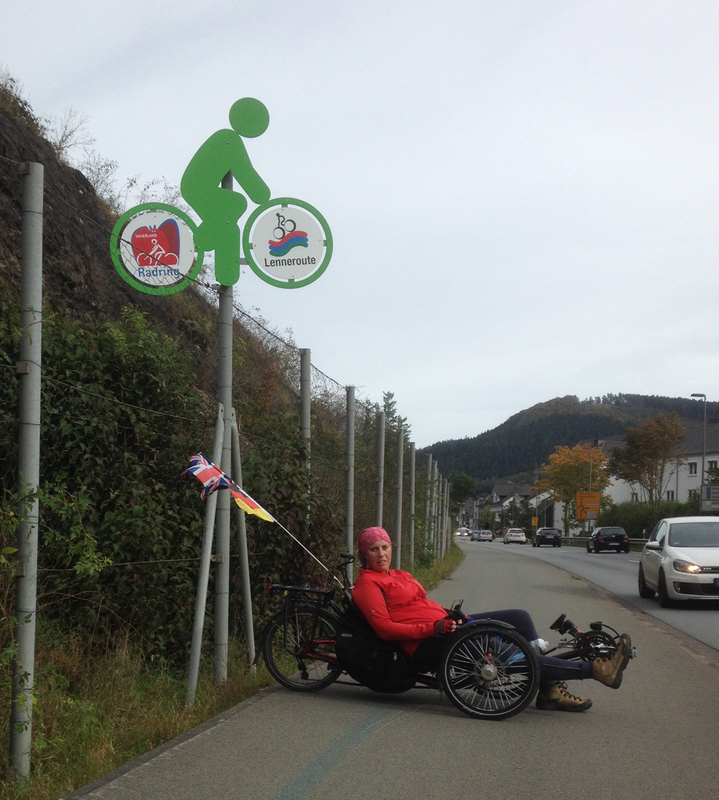 After all, recumbent riders like to do things differently! 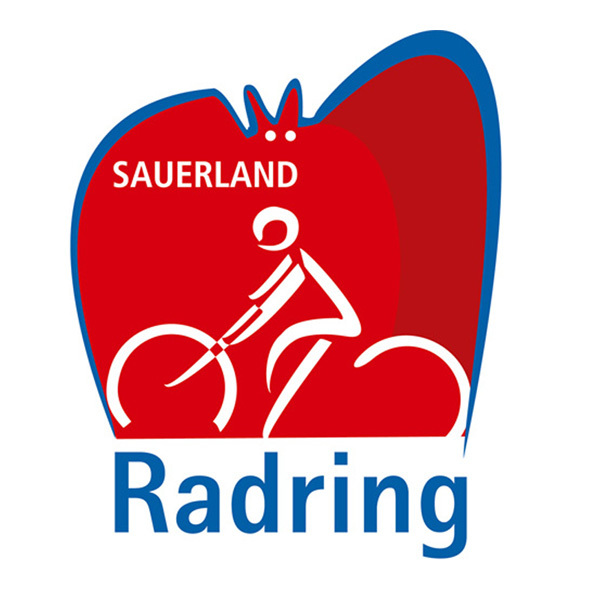 Radeln im Zeichen der Fledermaus: Ein Raderlebnis abseits der Straße, aber trotzdem auf bestens asphaltierten Wegen: Das bietet der SauerlandRadring. Mit seinen 84 Kilometern Länge spricht er vor allem Tourenradfahrer und sportliche Familien an. Auf der Hälfte der Strecke bewegt man sich außerdem auf ehemaligen Bahntrassen. So it suggests it’s not on the road but on well-asphalted paths and it suitable for touring cyclist and sporty families. And half the route is on former railway routes. So this all sounded very good, the 120km extra option was possible, and amazingly the weather forecast was pretty much perfect for our ride – dry, sunshine, 12-15 degrees (so not too hot). 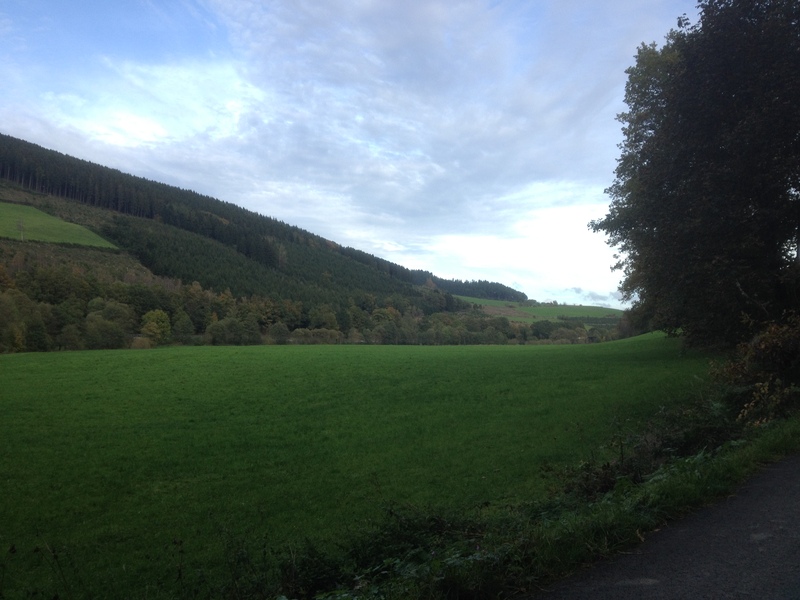 I hadn’t originally realised how far away the Sauerland is, and how fiddly the road would be to Eslohe. I would have to collect Klaus from Viersen and the total driving time would be two and a half hours each way. So I said I would collect him at 7am which meant an early start for me. Frank readied the VW Bus with its flat load area for me the night before and I put Alfie in, along with my tools and spares. I had changed the chain the day before (it had done 12,000km, they often snap at about 5000km for me so this was a miracle) and in the process had managed to break my chain tool so I hoped it would be OK. It was, but I need to shorten the chain a bit when I find myself another chain tool as in the big ring the jockey wheel was hanging straight down so very low to the ground. 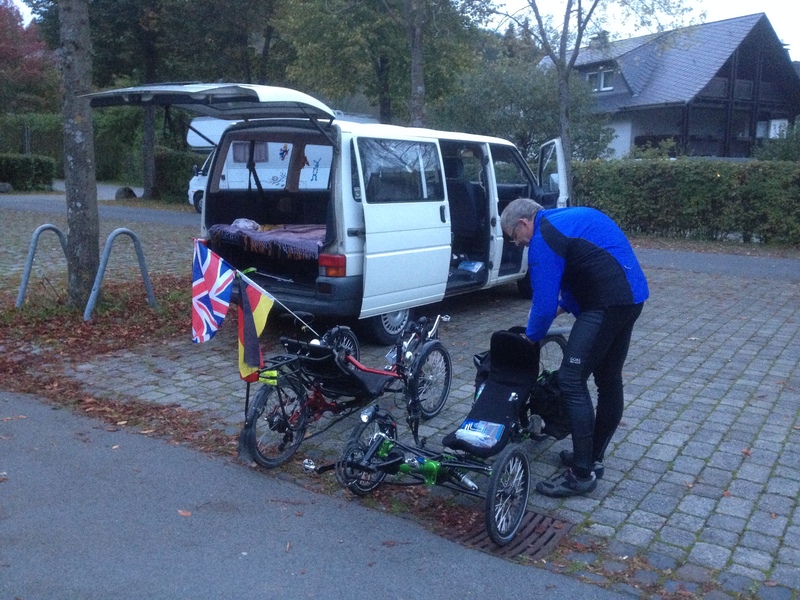 Anyway, at 7am I duly arrived in Viersen and Klaus appeared with his trike. It was the work of a moment to put the trike in the VW Bus with Alfie and then we headed off, using my iPhone’s SatNav app to direct us to Eslohe. Now my App speaks English (which is easiest for me) and the chap has a lovely clear voice, but he doesn’t pronounce German place names very well. The two hour journey from Viersen to Eslohe appeared to afford Klaus considerable amusement with all these new pronunciations of place names – his favourite was Wuppertal which, in Co-Pilot Live Satnav Speak, is pronounced “woo purtle” (should be “vuhp err tarl”). I was delighted to see that we passed an Autobahn exit for Wickede on the way too. It was quite a fiddly journey including three or four different Autobahnen and then a reasonably long stretch on an A-road which wound its way through some towns and villages. My app has a speed limit warning which is actually very useful as I’m not quite clued in to how the speed limits work in Germany. Klaus gave lots of very handy information, especially when I wanted to put the fog lamps on as it was a bit foggy. Apparently in Germany you can only use them if visibility is less than 50 metres (there are posts every 100 metres beside the road so you can gauge it) and you have to slow down to 50 km/h if you put then on. Rather different than the UK where people have them on if it’s a bit misty. Also if you pass a road sign announcing a village name then that’s automatically a 50 km/h speed limit (unless signs say otherwise) – not something I previously knew either. It was pretty chilly – the bus temperature gauge had said 7-8 degrees – so we had quite a lot of layers on to start. It was just 100 metres or so from the car park to join the track and I felt full of energy so zoomed ahead, before realising I was leaving my cycling companion behind. This is the result of having a proper English breakfast of Weetabix before you set off, rather than eating nothing. The route turned out to be very well signposted almost the entire way (there were a couple of occasions where the track on my Garmin was useful). And this is the actual track that we rode – as you can see we didn’t add the Nordschleife section to Meschede in the end. And here is the elevation profile of the GPS track. What this doesn’t show is how up-and-down the route was the whole time. Although it was partly old railway track routes there were an awful lot of sections which can’t have been part of the railway as they were very steep – 8% or 10% or more. Maybe only for 100 metres but that’s still pretty knackering on a trike. More anon. So from Eslohe we headed west on a good-quality path, slowly uphill and getting our cycling bearings after sitting in the car for a long time. We were rewarded very quickly for our hill-climbing efforts with some fantastic views. 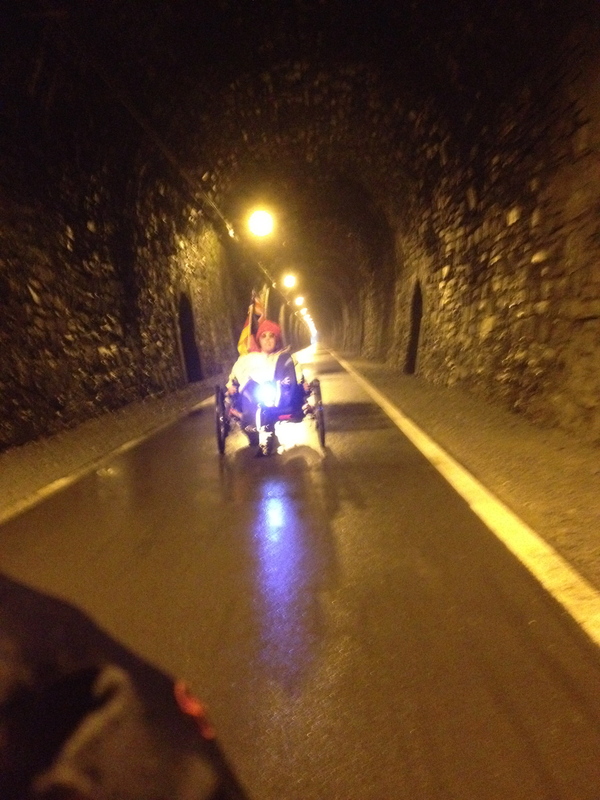 The first major event doing the route in this way is the so-called Fledermaustunnel (bat tunnel), although its actual name is the Kückelheimer Tunnel. 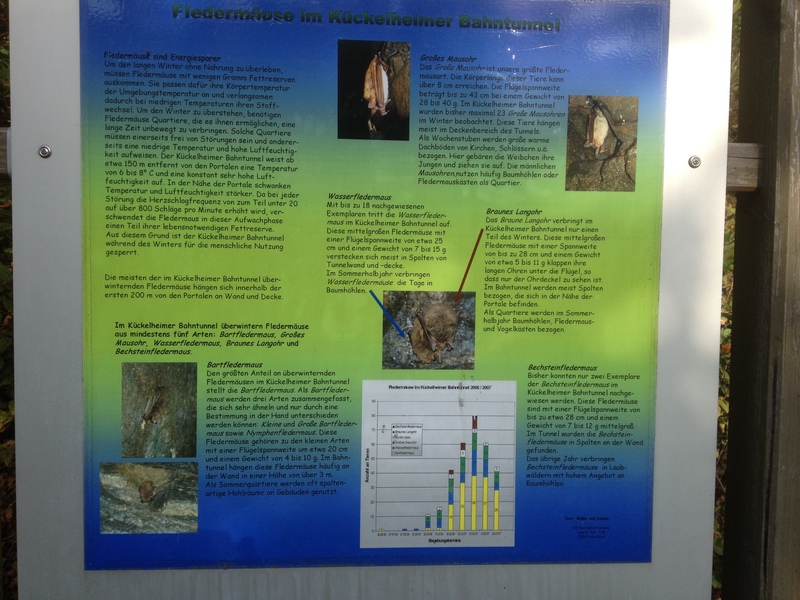 There was a sign beforehand which explained that the tunnel is a home to bats. And that we were lucky we weren’t a few weeks later as it would be closed (as winter roost for the bats!). 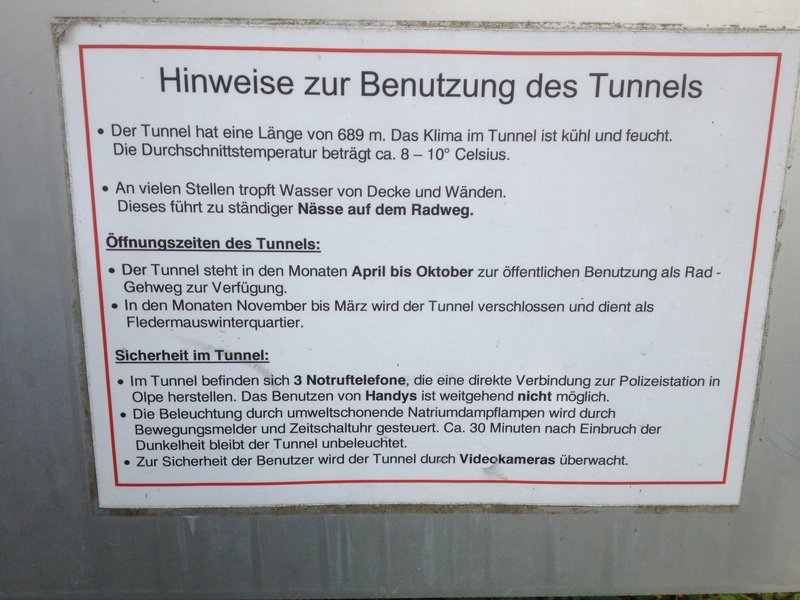 This sign tells you that the tunnel is 689 metres long and cool and damp – with water dropping from the roof and walls and thus it has a wet floor. And indeed it was quite wet in there so I didn’t stop to take photos – so sorry these are fuzzy! 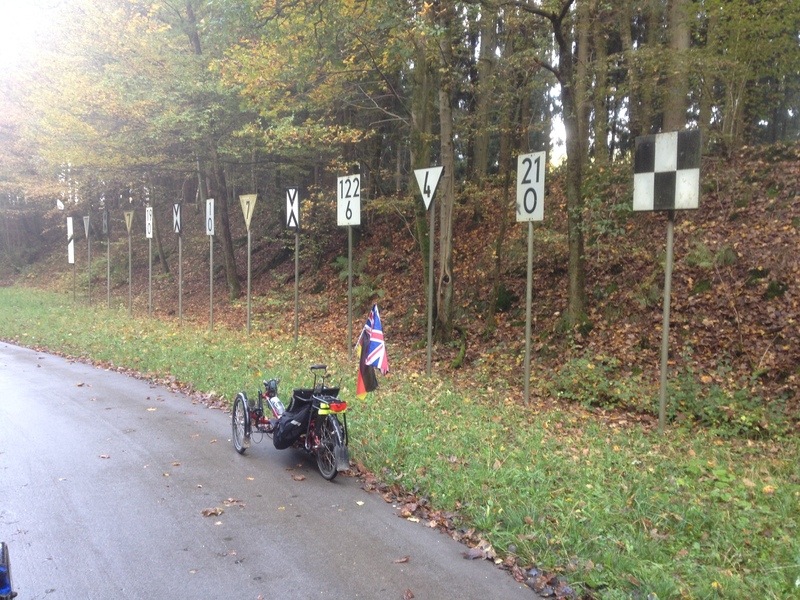 And here am I… spot the winter hat having its first outing in Germany. 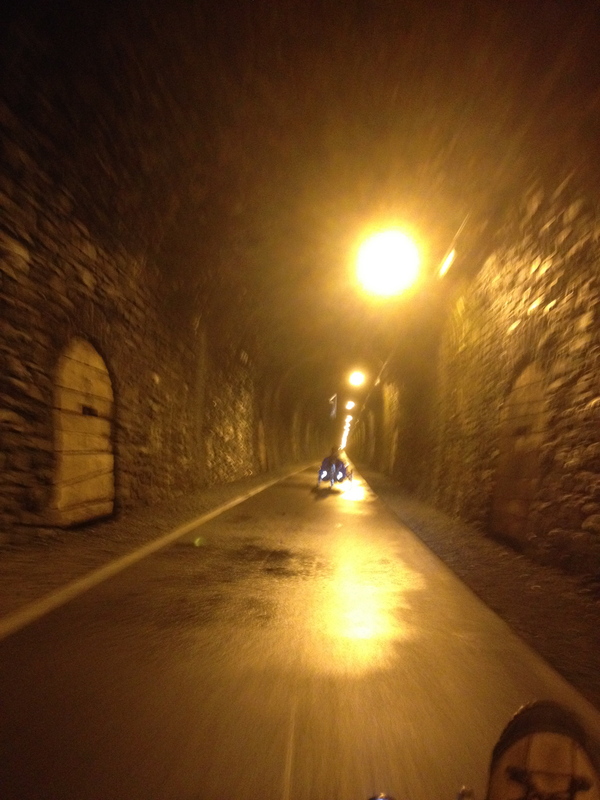 The tunnel was great fun – wonderful to have it just for cyclists and pedestrians. 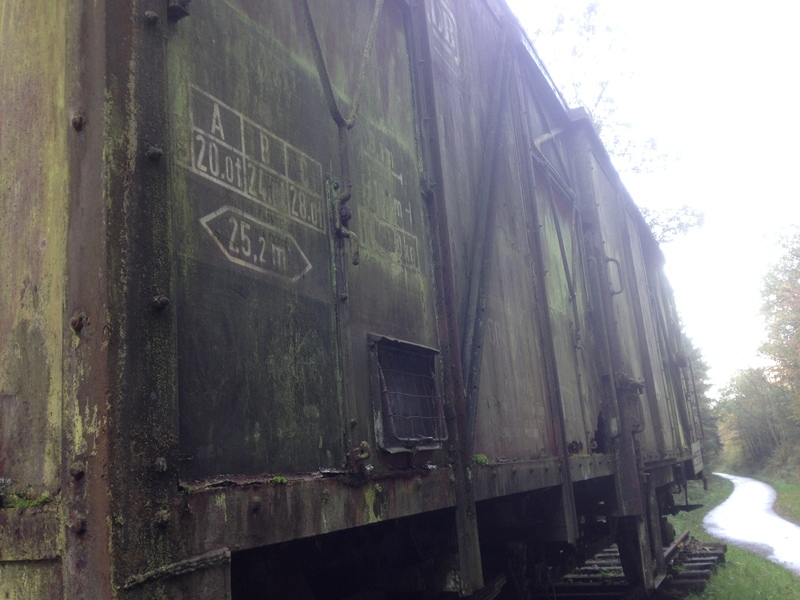 There were other reminders that we were on a former railway track for this section – such as this train rusting away gently on some tracks. And a bit further along there was an old, rusting carriage by the side of the path – which had clearly had a very interesting life! 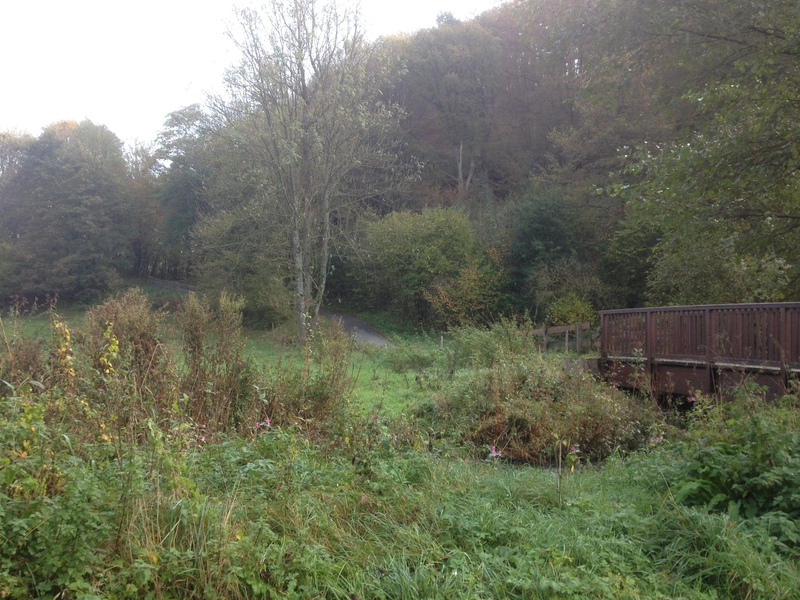 The route continued, leaving the old railway as we approached the town of Fretter. At this point I was rather keen on finding somewhere for a spot of cake and also for a toilet. We had a quick look in Fretter but couldn’t find any open bakery or café – then spotted a chap in his front garden and asked him. No, he said, nothing open here – or anywhere around really. My toilet need was not yet at the critical stage but I was regretting my decision not to use the loo in the hotel next to the car park at the beginning of the ride. So we pedalled on, with a very uphill-downhill section which saw speed variations from 10km/h to 40km/h within a few metres. 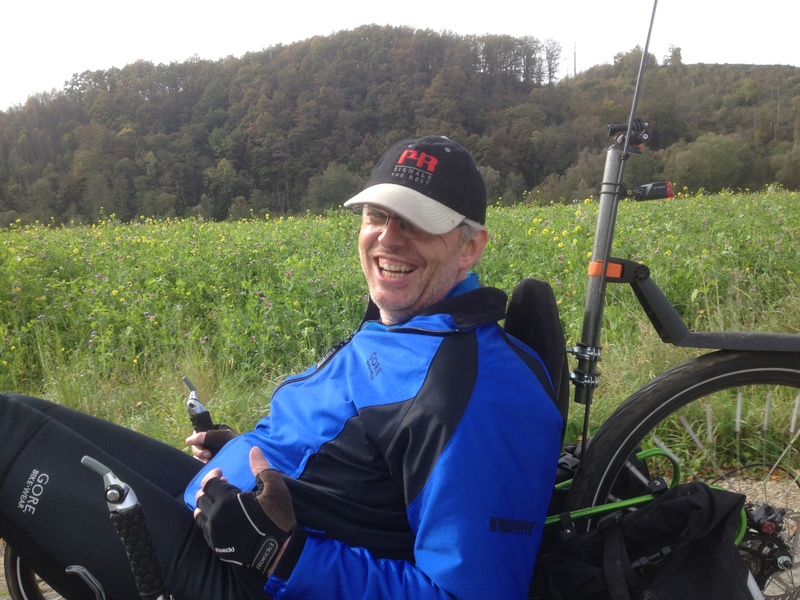 Some of the hills were VERY hilly – here’s a short video I took of Klaus attempting to get up a 10% hill. He’d been cycling on the spot for about 30 seconds before I took the video (note that I had managed to overtake him – I have a 20″ rear wheel and he has a 26″ wheel which I think makes it slightly harder for him traction-wise on these hills). And then I experienced a rather brown-trousers moment, entirely my own fault. I was in the lead and we’d just crawled up a long hill and I was looking forward to the downhill that would surely come – which it did, as you can see here (the downhill was probably 200 metres in total). So I whizzed down the hill, approaching the wooden bridge that you can see in shot. And this was what was on the other side of the wooden bridge (not very visible from the trike’s seat as I whizzed down the hill) – a ninety degree bend in the cycle path. I realised as I started crossing the bridge that I was going too fast to take this unexpected bend, but of course had no traction on the wet wooden bridge for braking so had to slam the brakes on when I got off the bridge and onto the paving. An impressive set of skid marks with my brand new Schwalbe Marathon tyres. I was speeding towards the fence with a bit of a drop the other side and thought I was going to hit it pretty hard. I uttered a rude English word (something I almost never do) and prepared for impact. Fortunately the tyres gripped just enough that I was able to stop with just a light tap on the fence with my front chainring guard (one of the best £25 I have spent in ages – it took out a car bumper a few weeks ago and seems to entirely protect the trike and his headlamp from damage!). I did a huge stoppie though, in other words my rear wheel raised right in the air and the pedals hit the ground. It all seemed to happen in slow motion but there I was, finally stationary with the front of the trike jammed under the fence panel. And then I realised there was another trike bearing down on me… Klaus was able to stop but also with a stoppie (lifting his rear wheel) but had seen what was happening (or had not been going so fast) so didn’t end up in a giant skid like I did. So I extricated Alfie from under the fence and stood around for five minutes feeling a bit shaky. Unfortunately we were standing next to a stream whose relaxing water trickling sounds made my need for the loo a bit more critical so I pulled myself together and we headed off again, in desperate hope that we would find a cafe with cake and toilet before too long. We crossed the L737 Landstraße at which point there was a sign for a Café at the local mill. Down a long hill but worth it for food/loo, so Klaus headed off down the hill as I crossed the road (I was a little behind at this point). And I took a good look at the sign for the café and it said “open Sundays and public holidays 14:00-18:30”. The time was 11am so no luck. So I waited at the top of the hill and sure enough Klaus reappeared, saying it was shut. I had saved myself a hill climb so that was a bargain. 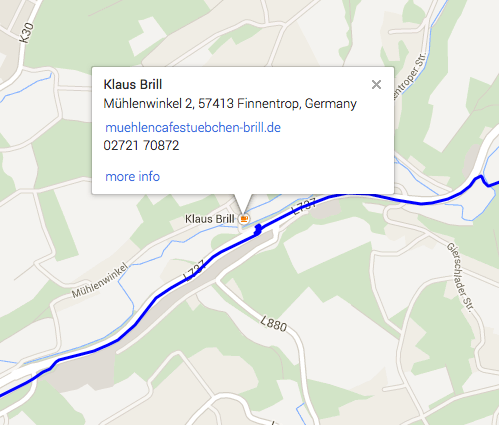 I see from Google Maps that the café is owned by someone called Klaus Brill so rather a shame it was closed! 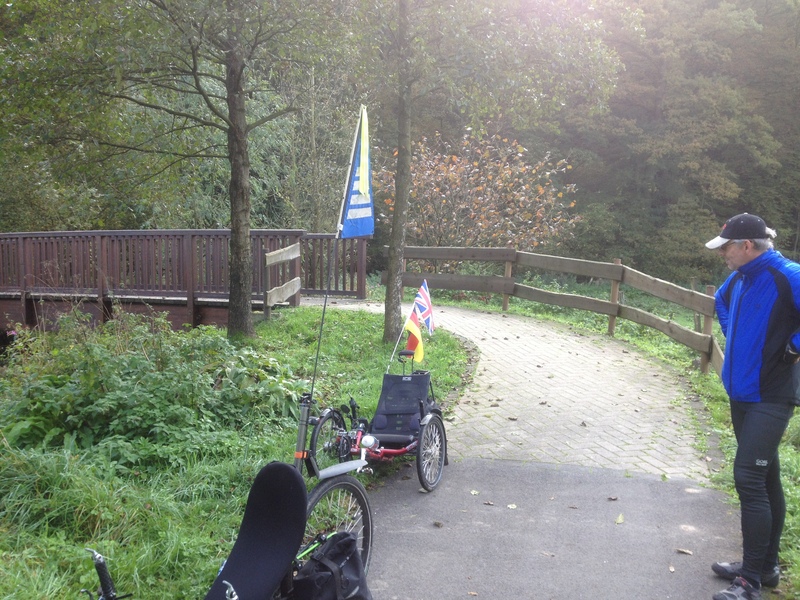 We knew that Finnentrop was only 7km away so pedalled onward, sure that we would find somewhere there. We arrived in Finnentrop – everything was shut. We found a lady walking a dog and asked if there was anywhere to get food and she gave a few suggestions but they weren’t particularly local. A look at my Garmin showed that the route continued after Finnentrop directly to a ribbon development named Bamenohl and that seemed to have several food places so we decided to carry on on the Sauerlandradring rather than trying to locate the places (a petrol station) the dog walker had recommended. We did a short detour to a restaurant but all was dark and closed so carried on. 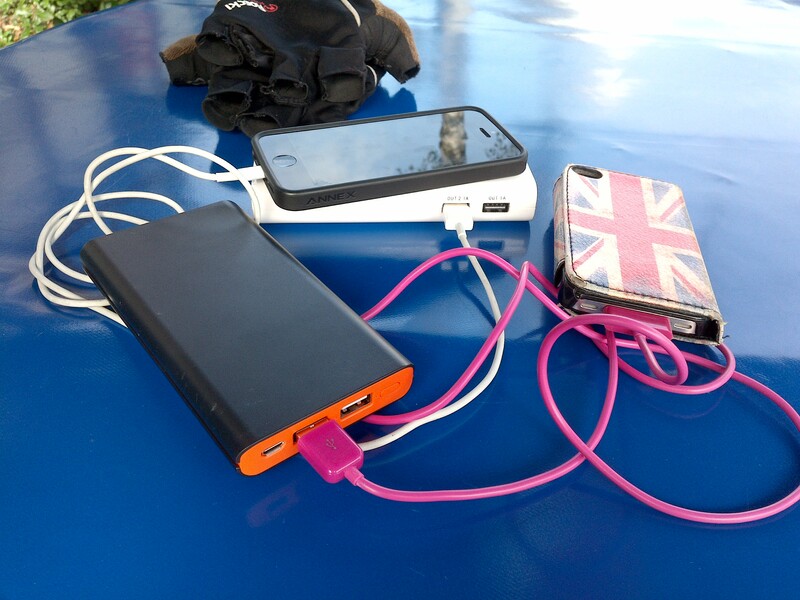 30km ridden and no open food establishments located – this seemed very strange! As we rode down the main street of Bamenohl it was clear that the lady had mentioned places here (a bakery opposite the Sparkasse) but we found a nice looking restaurant with seats outside – and it was open! Hurrah! 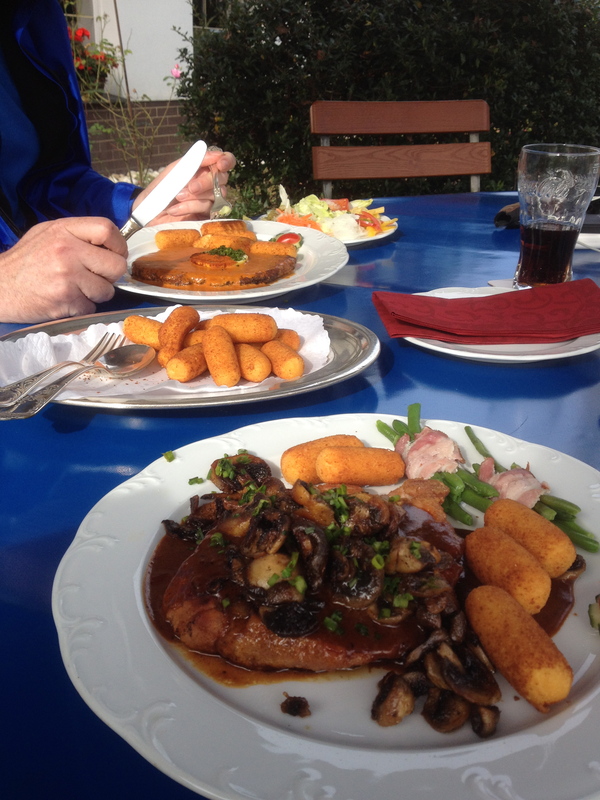 I availed myself of the facilities and then we ordered lunch – proper food as who knew if we would get another chance on this ride! We were both hungry after all the hills too. They also bought me Teewasser with milk at the first attempt which is unusual (usually cafés and restaurants in Germany forget the milk). We had a good hour’s break which was needed and decided at this point not to attempt the Nordschleife section – 85km on this hilly route would be enough for us both. The route now continued along the B286 road which wasn’t very pleasant cycling. We were to discover this further on in our riding – although this is billed as a family-friendly cycle route there are several sections of 2-3km that are on main roads, and I mean on them – no cycle path. We were cycling on narrow-ish fast roads with cars occasionally hooting at us (“Use the cycle path!”) but this was the correct route, signposted as Sauerlandradring, with no alternative cycle path. I would not like to take inexperienced cyclists or children along some of these sections. At Borghausen the route took us off the main road (phew!) and back into the up-and-down of the cycle route. There were some really steep hills around here, several of which weren’t asphalted. Recumbent trikes really struggle with traction on loose surfaces uphill and there was one very awkward section where we were both pedalling but nothing was happening except our trikes were kicking up sand behind them on each pedal stroke. 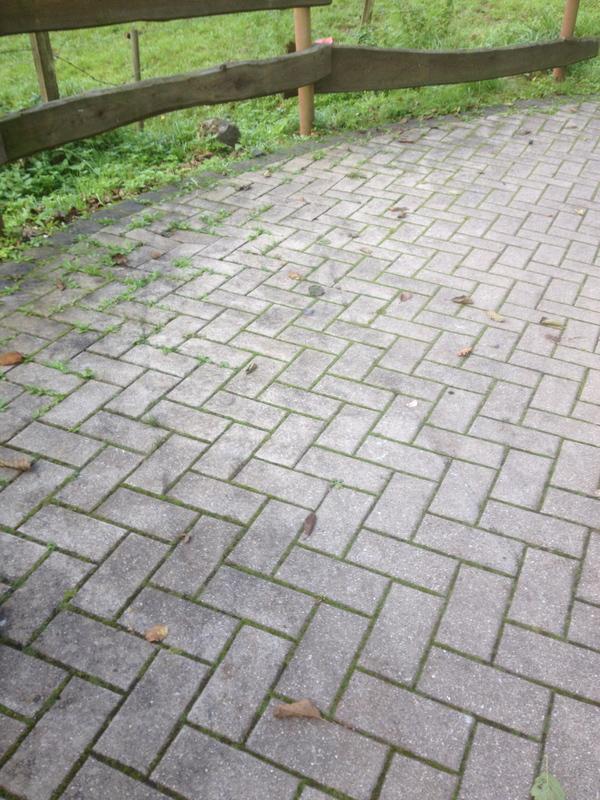 The slightly damp ground and leaf litter cover didn’t help. It’s amusing for a short while but gets a bit annoying at times. Klaus’s phone tracking app has registered a 21% incline at some point on the ride – which I think was actually a very fast downhill section as we approached Grevenbrück (if I remember correctly). Due to my earlier near miss I was using the brakes on some of the faster downhills but I still reached 50 km/h on this one. We rode through Theten which was a nice, open area next to the river Lenne. As you can see, my cycling companion was enjoying the break from uphills (as was I). We then found ourselves riding through the town of Altenhundem which seemed to have a collection of odd people out for walks. This section of the Sauerland has rather different inhabitants than Kreis Viersen. We kept pedalling, unfortunately once again beside a busy road. The next section on a pavement cycle path beside the main road seemed to go on and on, through several villages. It wasn’t at all scenic, a real contrast from the earlier riding with fantastic views of the valleys and hills and the leaves turning on the trees. After what felt like ages the route headed off the main road and back up some more hills, and more unmade surfaces (leafy sandy mud). More hard work! 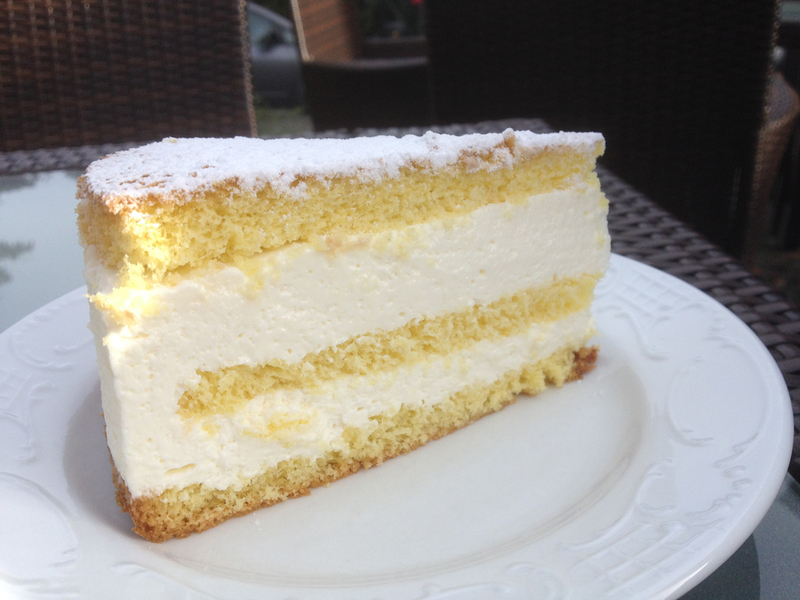 It was clearly time for cake so I suggested we diverted into the village of Saalhausen as my Garmin suggested that had several food places. Klaus agreed (he has now learned the importance of cakes on rides) and so we soon found ourselves at a very nice café sitting outside in the sunshine. 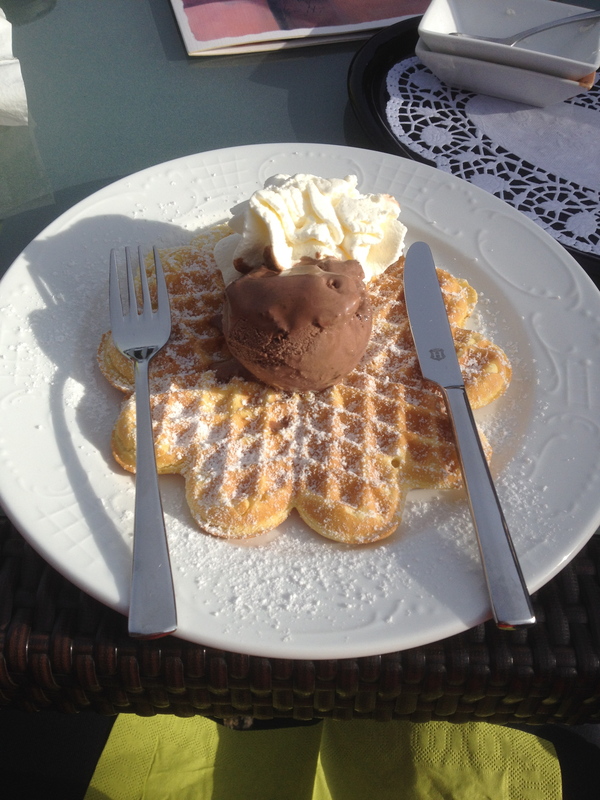 Rather than choosing a cake I had a waffle – I felt I needed the carbohydrates. But asked for ice cream and cream with it for the full unhealthy effect. We had just 30km to go which felt about right – the hilliness of the route meant that would be plenty. This route is variable – some horrible on-road sections, but then you are rewarded with some lovely views of the hills and valleys. And of course the trees turning into their winter colours was a bonus. We joined another Bahnradweg after a very unpleasant on-road section and whizzed along on the gentle downhill slope for about 8km. We had a bit of a discussion if we’d want to do this route again in the future and the answer appeared to be no. Although it was lovely in places there were too many sections which were beside or on busy main roads and there weren’t enough food establishments on the route to keep me happy! 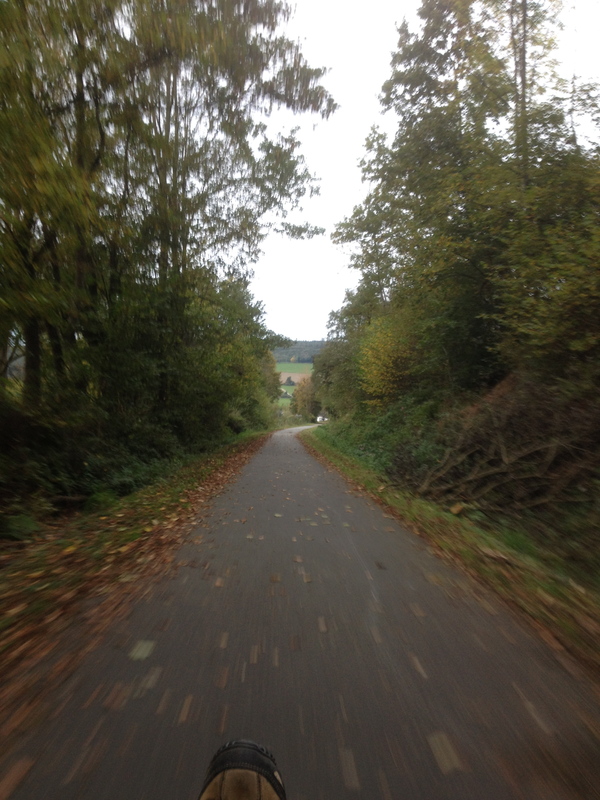 The Vennbahnradweg, which we rode a month or so again, is something we would both like to do again. 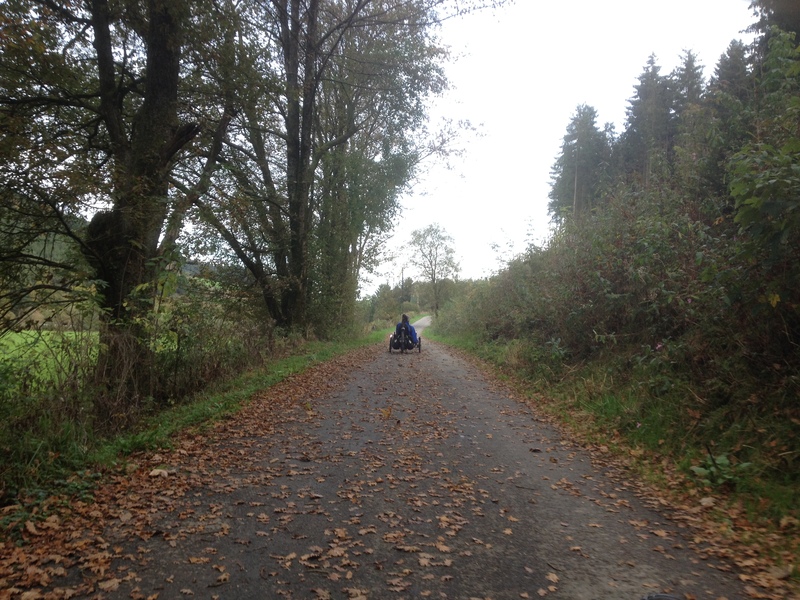 The final section to Eslohe was up a really nasty long, slow hill beside a road. My legs were feeling very tired now (I am not well trained for hills) so was relieved when we got back to the car. 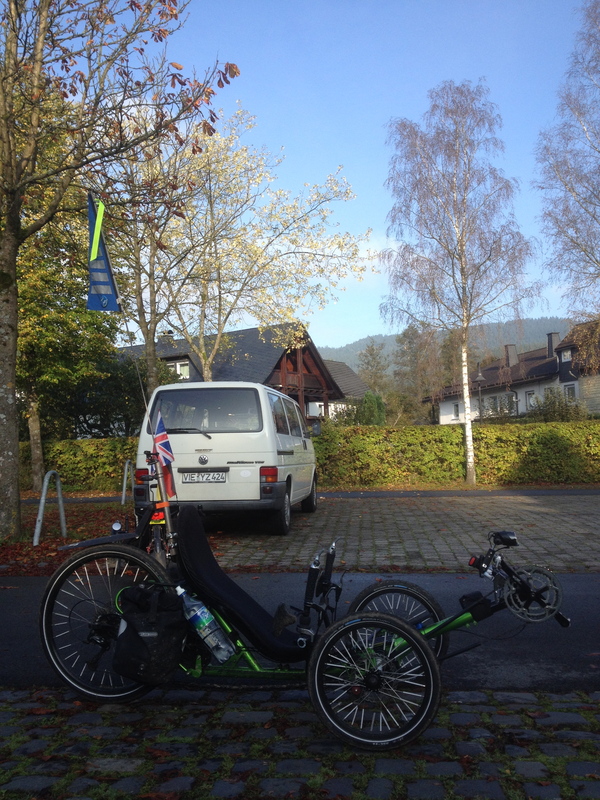 We just had to sort the trikes out again to go in the bus and then we headed off back again to Viersen and Kempen. Total distance for today was 84.83km at an average speed of 15.9 km/h (those hills, you know). I burned 2,438 calories so that was a bonus. All in all it was a very enjoyable day and we were incredibly lucky with the weather for mid-October. My trike ran well (despite the new chain being a bit long) and the route was fairly well signposted so we didn’t ever get lost (although the Garmin helped on a couple of occasions when we weren’t sure). Thanks to Klaus for his company, and particularly navigating the driving along scary German Autobahnen in the dark, and to Gudula and Frank and Lara for lending me the bus and looking after Poppy!